Electric curtain tracks can be controlled by remote, timer or light sensor and allow you to hang your own choice of curtains. They provide convenience and security and are backed by a 5 year warranty. 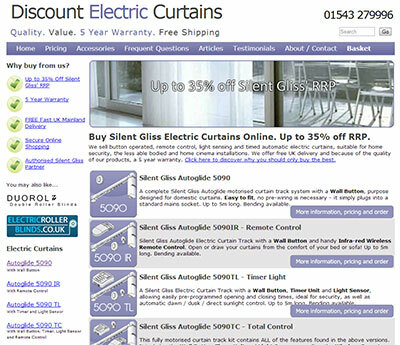 Our dedicated electric curtain tracks website will tell you all you need to know and you can specify your measurements and buy securely online. Please visit www.discountelectriccurtains.co.uk for more information and to buy online.